And so the Doctor created a virtual reality world that wouldn’t trap and kill its players. Japan rejoiced! What they got right: Seeing these “one emotion” Zepo people in action is equally amusing and disturbing, which I think was the point. The ending works and the art is rather good. The coloring is matched in well since this was originally released in black and white in the magazine. What they got wrong: Considering how the show was bothering certain parent groups in the UK I’m not sure doubling down on the violence (seeing the skeletal remains of the victims for example) simply because you don’t have to worry on the show budget is only making it worse. Yes, the groups were kind of overboard but do you have to prove them right? Other notes: While Marvel Premiere continued on (the teaser for next issue was a Star-Lord story) this was the last of the Doctor Who stories. 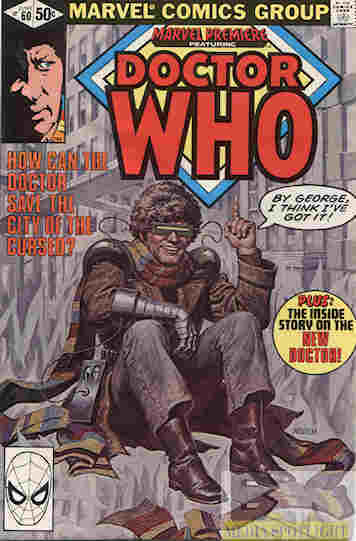 The pilot must have worked because the ongoing Doctor Who comic, which we’ll start on next week, went on for 21 issues. Interestingly a back-up feature in this comic introduced the Fifth Doctor and seemed to be a farewell to the Fourth, although Fifth would only show up in the final issue of the Marvel US run. The rest would be the Doctor, K-9, and magazine-exclusive companions. Recommendation: It’s a fun yet dark story, which is in line with Who at the time. It’s worth checking out. Posted by ShadowWing Tronix on August 1, 2018 in Television Spotlight, Yesterday's Comics and tagged Doctor Who, Marvel Comics, The Fourth Doctor. I’m glad that Marvel allowed the Doctor to grace the pages of Marvel Premier. Now I want to look up what Star Lord was about. The early version of the Guardians Of The Galaxy character. Oh…thanks for that tidbit of info.